I told her who I was and that I would like to take some pictures. She told me that she didn’t mind, but that she would have to call her husband to see if it was alright with him. She came back from the phone with her partner’s permission. 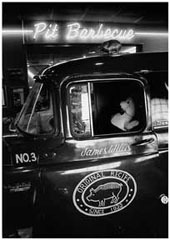 She pointed at the neon pig perched above the buffet. 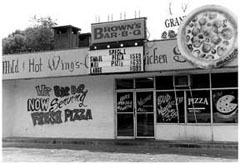 The words to the right of him read: Mr. Brown Goes To Town. “Why’s he going to town?,” I asked. I was pickin’ trays. You know. They used to carhop. Like they got at Sonic. Well I was workin’ and I picked the trays up off the cars and bring them back take the ? off. 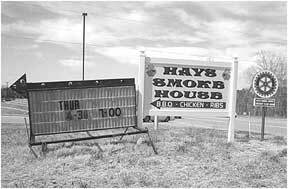 And had a gentleman cooking named Tom Tillmer and he stayed about three, no about two- down the street from me. I stayed on one street and he stayed on the next street. He’d holler at me and I’d holler at him. When I wasn’t doing anything, I’d go out there and sit with him. And that’s how I learned. He’s cooking at Leonard’s but we stay in the same neighborhood. He stayed one street over from where I stayed. You learned from an older cook at Leonard’s? 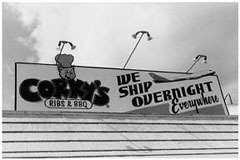 Always at night back then at Leonard’s. 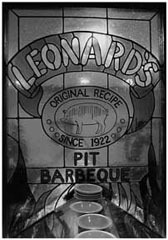 Leonard’s didn’t get- never cooked during the daytime unless it was for- help out. See, help out. I mean just like today we used fifty shoulders and then he couldn’t cook but 36 well then we’d cook fifteen more the next day. You know. You only cooked during the day if you had to? 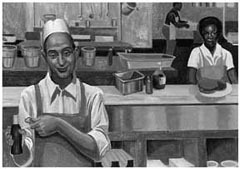 Leonard’s purpose for cooking at night was so that he’d have a night watchman. That was his purpose see. He’d have somebody at his place all the time. Leonard didn’t die until ’83 I believe. 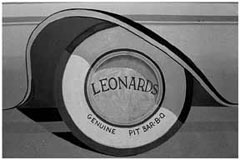 I started working for Leonard in ’58. I mean, no, ’38. 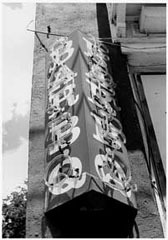 ’38. I started working for him in ’38. Then I learned how to cook and I started cooking in ’40. Been here a long time? That’s right, all my life. How did you get into the restaurant business? At that time you know, times were tough. You got your little old job, you kept it because you had so little money you know. Back then folks were working for five and six dollars a week. 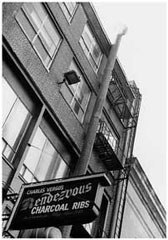 I started working for Leonard for seventy cents a day. That’s what they paid me to pick-up trays, seventy cents a day. I was glad to get that. Some people wasn’t making that. Young as I was, I was about 13 or 14 years old, and they wasn’t making .70 cents a day. I was about 14. I was born in ’23 and that was thirty-eight. I was about 15. Mostly a job. You didn’t cook at home? No uh, uh. Mostly a job. It was a job. That’s all it was, a job. It wasn’t nothing that I did at home. I tell you right now, I don’t ever cook at home. Yes sir. Oh yeah, I likes to cook now. But I ain’t able to do all that cooking now. Do you teach the young cooks? No. Mm, mm. It’s not on the same basis that it was then. How was it different then? We’ll you had to have somebody put it on. Keep a fire under it. Turn it every hour and a half, two hours and know when to put the fire. See now they got it now where they puts it in these pits and then turn it to 250-350-180 whatever they want it on and it stays there. Nobody have to turn it. Nobody have to look at it. Nothing. When that times up, it’s done. Everywhere now. 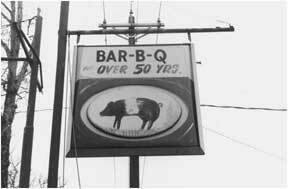 I don’t think nobody in Memphis that’s cooking barbecue like they cooked it in forty. Forty-eight or fifty. Even seventy. Maybe 60. Because, they’re getting away from that labor. Getting away from that charcoal. They got to pay a man to stay there all day. Well, he don’t have to do nothing but turn the machine on. Now you have to have somebody to take it off. But you don’t have to have nobody open that pit every five or six minutes and see whether it’s caught a fire or not. You cooking it on an open pit that grease gets hot and starts a fire. Everybody got away from that. Gas. Electricity. Like you see them have on your back porch. We’ll that’s the some thing all these places got now. They flavor it with oak. Some of ’em even pour liquid flavor on it. Not a lot of teaching to be done? No. Ah, ah. Mm, mm. They do it differently now. The only thing you have to learn them to do now is maybe trim a shoulder. They have that fat on it you know. Somebody to learn them how to do that and they put it on that pit and they don’t need no cook there no more eight or ten hours. Put it in. With change there’s not much to teach now? Not too much to teach now. Everybody can’t eat salt now. It’s done got so now there’s very little salt used. Oh yeah. You know, when we cooked it from scratch. We used a lot of salt. That’s all. Just salt. And when it gets about _ done- until you done cooked it about seven hours. You got about three more hours to go- then you put your basting sauce on it. Well everybody has different. They have one now that consists of vinegar, mustard, sweet milk, lemon. But you could make you a basting sauce. See that’s the main thing. 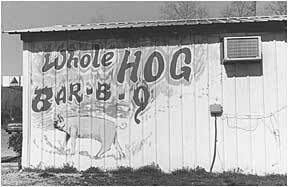 People will tell you about barbecue. Anybody can cook barbecue. I’m not lying about it. It just takes time, if you’re cookin’ it. But now you can have a place here and I can have place here. And this man here makin’ sauce and go down here and get that man’s meat. I can come here and get this man’s meat. And I can make me a sandwich and put that sauce on either one of them and you can’t tell the difference. See, your sauce is your barbecue. 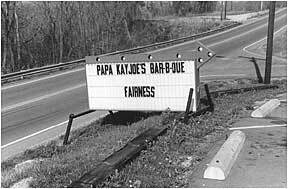 People can holler about it but now I just tell you a fact that barbecue- you got to have a sauce. You ain’t got a sauce. You ain’t got no barbecue. You know, that’s where your business is. 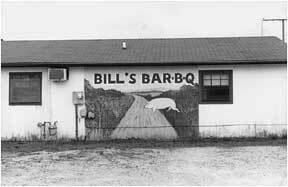 You got a good sauce now you got a good barbecue. You get somebody to eat your sauce, you can do all right. I don’t care how good they cook the barbecue; you ain’t got no sauce, cause everybody ain’t gonna eat plain meat and bread. Them other ingredients that slaw and that sauce that makes the barbecue. 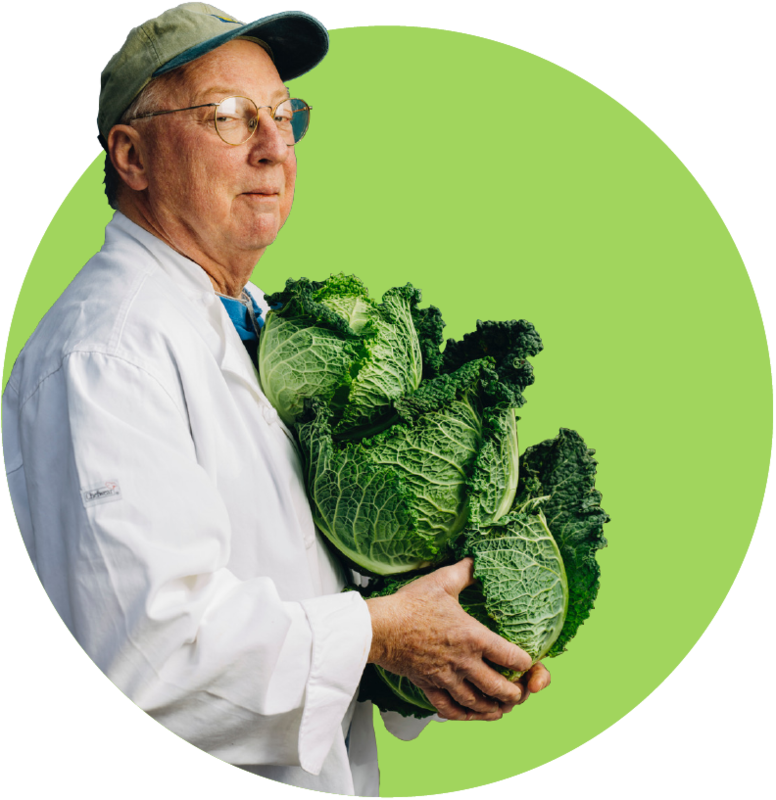 Slaw and sauce as important or more important than meat? Yeah in a sense. Cause slaw and sauce is 85%. Well I likes this sauce. See they got a sweet sauce. Like the kitchen? Why do you keep working? It’s something to do and I likes it. But I mean I come cause likes everybody out here and that one day I can get a chance to see them. Cooking that barbecue. But we don’t do that no more. Least Favorite part of work? What do you like about being with the people? We holler at each other and go on. Drink coffee. Friendly. Like family in the kitchen? Me and that lady there, we’re the oldest here. She’s been here a long time to. Ms. Loretta been here a long time but- -Merlene. Have you talked to people outside of Memphis about your food? We talked to that book out of New Orleans I think it is. That living. 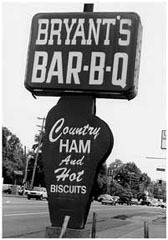 Has your food gone beyond Memphis? I’ve had a call from ‘Frisco asking me about it. And I had a call from Texas, three or four times.They can’t pay a man to cook no barbecue for them at home. Can’t pay him. No they just asking you how to cook it. You can see these people here every day. Why do they keep coming back? Cause they like the food. You know, back in the forties up until around eighty, the folks dying out you know. People you see everyday now you could go out there and be hopping those cars when they come in you know. And you could see a car, I’d say a half a block away, and you know what he wanted before he come in the driveway. That car hoppin’ they stopped there in the street down there at Bellevue and Maclemore every Sunday evening from I’d say from about 4:30 ’til about 6:30. That street would be stopped for them folks getting into that place. Sunday evening was the evening when he’d get the most customers at one time. But now they did good business Saturday night, every day through the week. But now on Sunday, it’ll be a jam-up there I reckon because during those days it wasn’t many cars, you know, and folks had their children out for recreation and about 4 or 5 o’clock, they’d all come by there and eat. But now they could eat barbecue, for two for a quarter. It went up in ’46 to .15 straight. And then it went up to .20 I think. Then it went up to a quarter apiece. But now back there in ’40 and ’41, it was two for a quarter. 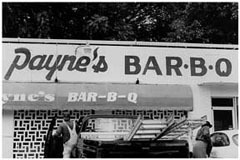 People would come in there and eat and buy one barbecue and he’d get a fifteen cent ticket see and he’d hold that ticket until he get ready to go and then he’d tell you to bring him another barbecue and he’d get that barbecue for a dime. Sunday nights the big nights? I’d say from 4:30 to about 6:30 on Sunday night. They had more customers than they have now. At one time, now. They had their children out. Well I wouldn’t know because I don’t be here every day. I reckon there is. 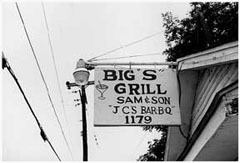 Any regular customers from the old days? Well I’d know them when I see them. See I never worked out in the dining room. I worked in the kitchen. They’d know your food but not necessarily your face? That’s right. 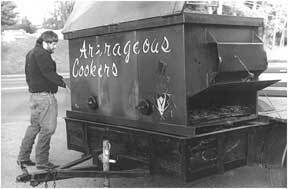 We used to do lots of commercial cooking like you bring a shoulder you want it cooked. She’d bring a shoulder; she’d want it cooked. She’d have a pork roast or a beef roast that she’d want cooked. And I know at various times they would ask was I going to cook? And they’d say well he’s off two days now he won’t work no more until Sunday or he won’t work no more until Saturday. We’ll they’d say, well I’ll bring it back. They did that up until I believe 65-66. Cause he sold it in 68 and I don’t think we was doing it then. No they’d by ’em at the store. It was higher to buy it from Leonard’s. See you could get a shoulder for about nine or ten cent a pound. You could get a 12 pound shoulder for about a dollar-ten and you’d bring it to Leonard and Leonard charge you 7 or 8 cent to cook it. Then, if you bought one from him, he’d charge you seven or eight dollars. I think now, if you buy a shoulder from Leonard’s now, it’ll cost you 45 or fifty dollars. That’s a long ways from seven or eight dollars. Labor day. I remember Labor Day. Cook and have the shoulders in grocery basket. Wrap them and put them in a grocery basket and them folks could come in there and buy them when they were $7.50. Labor Day back then ’65-’66. We’d sell ’em out before you could get them in there. It wasn’t too much of my food. It was Leonard’s food. What do you hope that people say about your food? I hope they say it’s good. What do you want the customer learn from your food? Try cooking it at home? They can. They get tired of it. They cook it once a week. What’s the home cook missing? They don’t have the patience to cook it. They’re home cooking. Home is great for a little bit. You cook a shoulder at home. You could say well, I’m going to have me beef and shoulder and you go out there and you start up to cooking. Well now, you going to stay there twelve hours? Gonna stay there twelve hours and then when you get it done, ain’t but three or four people going to eat it. You done put twelve hours in it. That’s the main thing. It just takes too long. Barbecue is a slow process. Now they can go out there and cook a few steaks, some ribs, maybe then every now and then you may find somebody who will stay out there and cook a shoulder. But he ain’t going to sit out there an cook no shoulder in a minute. Can’t do that. Now he may go out there and cook him some ribs in three or four hours, four or five hours, but you cookin’ that stuff out there on them coal pits. Now if you’ve got a pit that you can keep at the same temperature. That’s just like those in there. You ain’t got to sit there and you know your temperature is going to stay that way. Now your running about 260 maybe it won’t get no higher than 300. Our pits never did get no higher than 350. Well now after you been sitting there for about an hour it’s gonna fall if you don’t put noting else in it. See, when you cook it like we used to cook, with that charcoal, you got to continue to make a fire about every hour, hour and a half. The way they cookin’ now, they ain’t got to continue to do nothing cause it’s going to stay that temperature. You got it set at a 150 or 200 and it’ll stay there. Under 300. Well on a shoulder. See, you ain’t gonna keep it no 300. It’s going to go up and down. Sometimes it’s liable to wind up with a 150 on it. Then, when you scatter that fire, it’ll go back up to 300. I estimate that it may stay 300 about ten minutes or fifteen minutes. Then it’s dropping back down. It ain’t gonna stay that 300 no eight or nine hours. That’s the reason it takes so long. 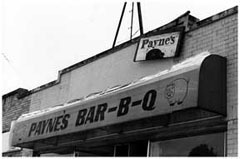 Old style versus new style barbecue? I don’t think it’s no better, but I believe- I don’t know. Some of this we got here now, I don’t tell no difference. We got that sauce. You’ve got to have that sauce. We bought salt like we bought everything else for the pit. When we run out of salt, we’d go to the store and buy some. 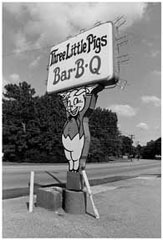 How does barbecue hold a place in Memphis vs. fast food? 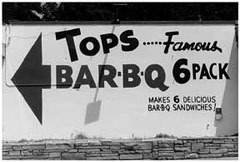 This is a barbecue town. I don’t know either. 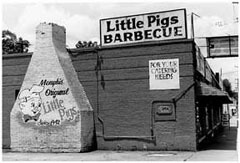 Memphis is a barbecue town. I can tell you that. Barbecue and chicken. 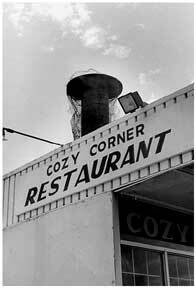 You can’t go into no restaurant in Memphis and can’t find chicken. Chicken some kind of way. Maybe stewed, baked, but a chicken is in any restaurant you go to. 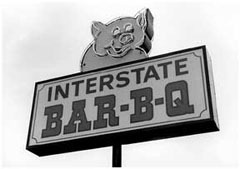 Barbecue restaurant, you going to see that chicken. Any restaurant you go in, you gonna find chicken. I don’t care what they feed you, chicken gonna be there, somewhere. We have chicken here. We’ve got barbecue chicken here. Working at Leonard’s. Unforeseen opportunities from working the pits? I raised five kids. Had one to make $105,000 a year. He’s at the post office out in California. I got one over here at Baptist over here at the Med- I believe she’s making $50,000-60,000 a year. And they all got good educations. All my kids got good educations. Couldn’t want no more. I raised all of them. Ain’t nary a one of them give me no jail time none of that. None of my kids. They all finished school. I got three that finished college. And I got a boy, he’s a supervisor down at commercial pier. I had a girl. She got sick. She’s working for the Telephone Company. She had to retire. Her legs went out form under her. I got a nurse out there at the Med and I got a girl retired from the Post Office and then the other girl, she’s in the postal service. And I did it all here at Leonard’s. Did they ever come to work with you? No. No. They stayed here though. Strangest thing that ever happened to you working at Leonard’s? That great opera singer, what’s here name? What her name? I used to cook for her. Send her a shoulder or something out there. Shoulder, turkey. Tom Tillman. I learned everything from him. At that time, we was cooking. Showed me how to trim it. Showed me when to turn it. When to make fire. Tell when I did a batch of taught meat tell me what I did wrong. Now you can go out there and cook you a batch of barbecue now and you come up with nothing. It’s tough. That’s the reason I said it takes patience. 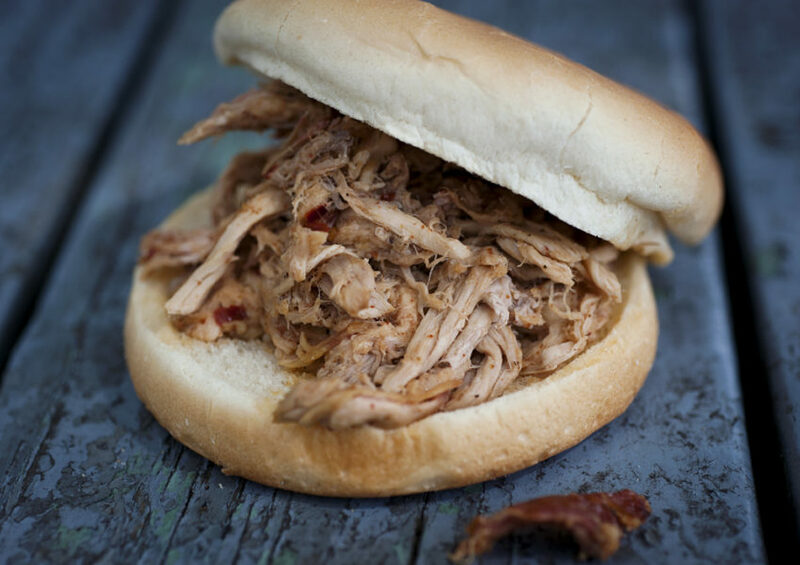 You don’t go out there and cook a batch of barbecue and it come up tough. 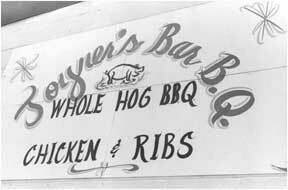 People would day, “That meat was so tough.” Ribs, we cooks them on the pit, about 250 up there we cook them ribs on. We don’t cook them in that cooker. We cook them with charcoal. That’s the only thing they cook now with charcoal. You can cook a rib in two hours. You can’t cook no shoulder in two hours. That makes you have to hire a man if you cook them with charcoal, those shoulders. [To cook shoulders with charcoal] You got to have a barbecue cooker, shoulder cooker. Can’t leave it up to the help to get back to it later. Other shoulder cookers in Memphis? I talk to lots of them (other pit masters/shoulder cookers) but I mean, they all died out. Cause they ain’t nobody doing that now. No just about all my generation, all my folks that had places back then, when my was in my blues, have even gone out of business. I know them. They ain’t cookin’. I don’t nothing but ribs. They got those machines. What are you going to do? Go home? I just come down here. He just lets me come down here and cook them one day. I don’t see where they are. He knows I need the work. I reckon he’d give me three or four days if I was able to do it. But he knows I ain’t able. They’re cooking at night, but they set the machine at night. They don’t need nobody to watch it. They put on at ten o’clock at night and then when he get here the next morning at six-seven. It’ll be ready. They used to put it at ten o’clock at night and don’t have nobody to watch it. Come the next morning at seven o’clock and they wouldn’t have no meat. Cause see, that grease dropping down on them hot coals- flame it up. That grease live. If you know how you scatter it back in there. You get chunk of charcoal like that in there and you don’t go in that pit and watch it and keep it down, your liable to have a blaze. Tending the pit means keeping the fire down? Down. After that meat gets hot, say that meat’s been on there an hour, two hours and got hot and you scatter a sack of charcoal under that meat. It’ll blaze up. You have to add water to the fire. Down. You don’t want it blazing. Slow down. Keep it under 300 see. But see it’s going to go down to 100. Then you build it up. When you build it up, try not to build it up over 300. If it’s 200, it’s cooking pretty good. You don’t need to put nothing under it. When it gets down to 100, then you make you another fire. Slower you cook it, the better it’s going to be. Give it time to penetrate all the way through it. Yeah, man. That was in ’22. I was born in ’23. That’s Leonard’s money. That was his money, that sauce. You can make a sauce that the folks like and put it on some meat or something. You can make some money. 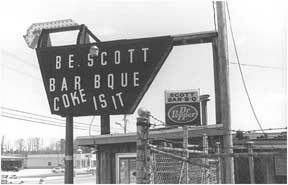 Now, if you, cook barbecue all day long and you ain’t got no good sauce, you ain’t got no barbecue. Sauce separates you from the money. Make a good sauce, you make the money. Didn’t let make nobody make it. Leonard did let nobody make no sauce. The cook. He didn’t let everybody make the sauce. That lady named Annie, she was the first one that made it. Right before Leonard came out of the business, he had another lady, her name was Ernestine. I’d say after 47, 48, and 50 when he started to remodeling then a lot of people made his sauce. You worked in the kitchen, they show you how to make it. It wasn’t much of a secret after ’47, how they made that sauce. You’ve never seen the sauce recipe? No never. I ain’t saying that I couldn’t have seen it. I ain’t never been interested in seeing it (the sauce recipe). Enjoy the pace of cooking shoulders? That’s what it took. That’s what I tried to do. (slow cooking) I tried to do what it took to get a good job. I never did go out there and just try to back up now. I went out there to do what supposed to have been did. Sometimes, James we going to run short. You have to bring it on. You got to put some fire under it today. Well then you know what you had to do. You had to go out there and try to bring it on.But now just regular, just go on out there and do what you got to do and get on. Family ever come to eat at Leonard’s? See now you’re talking in a different era. Your talking in ’40-’60 even- see we couldn’t do that. Couldn’t bring my family back there in the sixties until sixty- whenever integration was passed. Yeah. I was in the pit. I was off from the business. I was in the back. That’s where the pits was. Never see the customers unless they come out there. Sometimes they come out there and want to know something or want to see how it was did, you see. But you never did see the customers. It’s just like now. You be in that pit now. You don’t see no customers now. Back there in them days I couldn’t bring my family down here no way because they didn’t allow that. But now, they would. I could now. 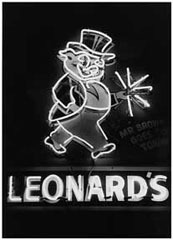 Do you remember when your family first came to Leonard’s? 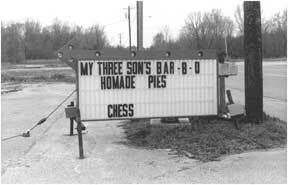 I never did carry my family to Leonard’s. Now they could come. My wife comes out here now maybe once every two months, three months. But you take from 1958 ’til integration was passed- that’s sixty something- I never went out there in that dinning room and sat down at all. (eating) I can count the times that I’ve been out there and sat down. I don’t never go out there and eat. "God gives everybody so much. 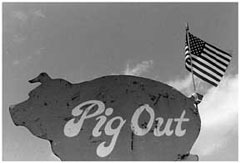 If barbecue is yours, that's it."